With a lot of patience and a bit of luck, anyone with a camera can catch a cat's true nature. Here are 25 times that's happened in a particularly exceptional fashion. An offer of peace, or a promise of annihilation? It's impossible to tell, but it's probably the latter, knowing cats and all. On the bright side, Death by Kitten is consistently voted as the #1 preferred mode of demise by those polled. This move's a tough one because it requires a human partner who is both cool and magical — a combination that is sadly in short supply in this degraded era. Earnest, heartfelt imitation only for this one — none of your holier-than-thou feline mockery. More of a surprise lick, actually, which is both harder to pull off and vastly more unpleasant. This requires a patient photographer and a cat who is primarily motivated by pure evil. It's a far more common combination than you might expect. In case you've ever wondered who the mysterious marketing geniuses are behind Meow Mix. It's easy enough to photograph a cat punching a Pomeranian — happens every day — but the expression of pure outrage is the real payoff here. All you need for this is a cat and a very expensive vase, and you can just sit back and let nature do the rest. 11. No, seriously. This guy. It takes a true master of being a cat to fly backwards through the air and yet still somehow look lazy. 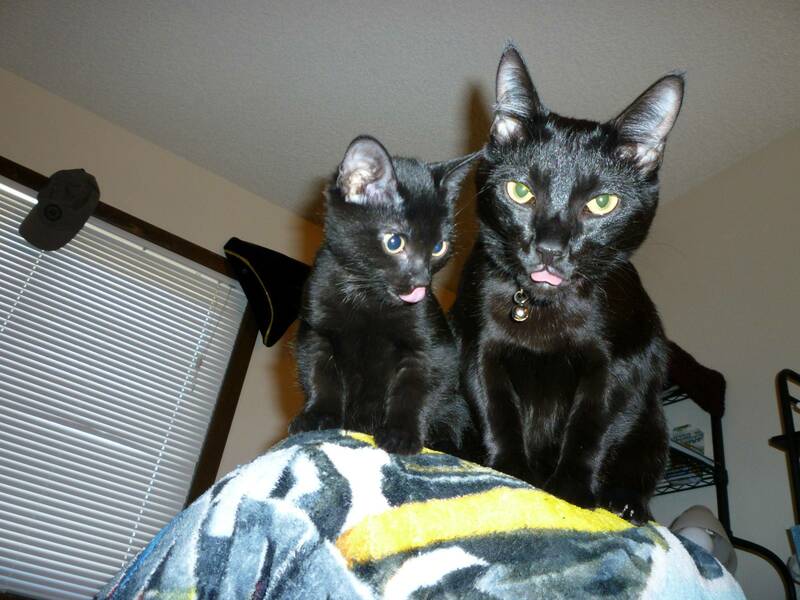 This particular Double Lick is a bit of a cheat, as both of these cats have unusually tasty noses. Just throw on "I Will Always Love You," get out your camera, and your cat will almost certainly handle the rest. 15. The "Here Comes the Airplane"
Protip: Cats don't give a damn about "here comes the airplane" any more than babies do, but if you put cream in a spoon, they will lick that spoon whether you tell 'em it's an airplane or not. Protip: Way easier than actually taking the time to grow a real cat beard is just getting your cat to look up at your glasses at exactly the right time. When cats touch their butts together and make a heart with their tails, it's actually a form of love that is so far beyond our own meager capacity for emotional attachment that it's essentially beyond our comprehension. Looks nice, though. This one's super easy: You just need an old desk and one really, really surprisingly long cat. Ten times out of ten, The Unpleasant Surprise is 100% deserved, and is actually just a form of cosmic justice. 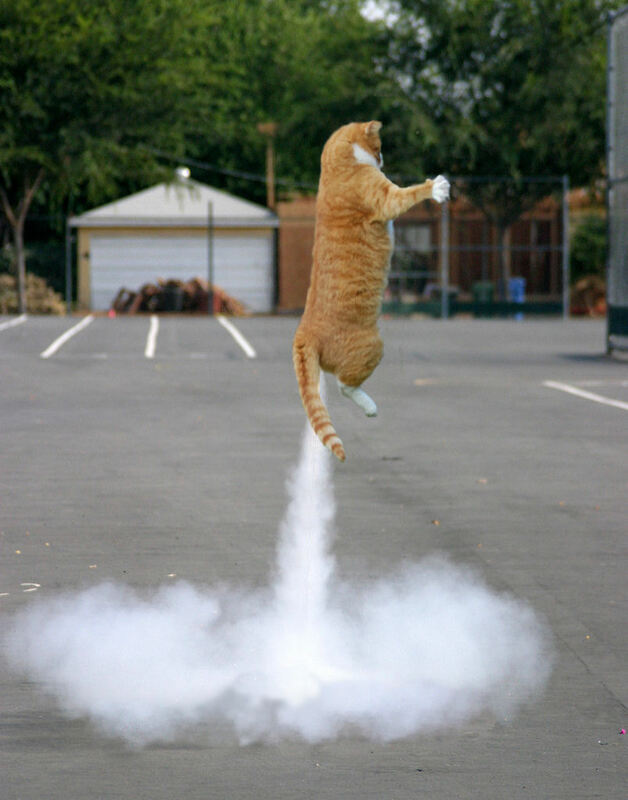 Most rocket-propelled cats can pull this one off for you if you ask them nicely. This one can be a little dangerous, and you should definitely practice it in the driveway before going onto the highway to get the shot you need. Even smallish victories, like upending the litter box, or chewing through someone's shoelaces, can bring this about — so have your camera ready at all times. This one's almost impossible to get because it's really hard to find a cat who is conscious about his or her weight. 25. The "You Think I'm Just a Normal Cat But I DO A CRAZY DANCE WHEN NO ONE IS LOOKING"
Best of the bunch right here.